Most cars come standard with four speakers, two in the front and two in the rear. 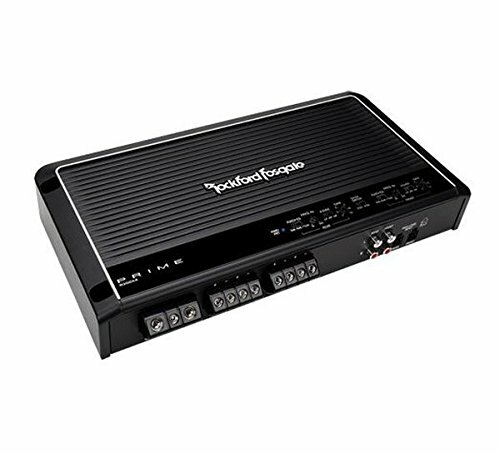 The best 4 channel amp can supply an equal amount of power to all four speakers or both the speakers and subwoofers in your vehicle. Typically, a 4-channel setup will be “bridged” which means the front channels will power the component speakers and the two rear channels are combined into a single, more powerful channel for the subwoofers. The beauty of a 4-channel amp setup is that there is a dedicated channel for each speaker, which makes it easy to maintain front-to-rear sound control. However, a good four-speaker audio system requires a quality 4-channel amplifier. Find our list of the best car amplifier 4 channel. The Rockville dB45 is one of the few budget-friendly car audio amplifiers capable of powering speakers with enough juice to produce a thunderous amount of sound. This is largely due to its incredibly powerful total power output of 3,200W spread across four audio channels. Built on Class-A/B circuitry, the dB45 is the newest addition to the dB-Series of amplifiers produced by Rockville. The power handling of this amplifier is truly the best available in its price category, as it peaks at 3,200W and 1,600W RMS while remaining compliant with CEA-2006 standards. With a high-speed MOSFET power supply, you never have to worry about shorting or overloading with this amplifier either. Instead, the device enters into protection mode whenever a thermal or power-related malfunction is detected. 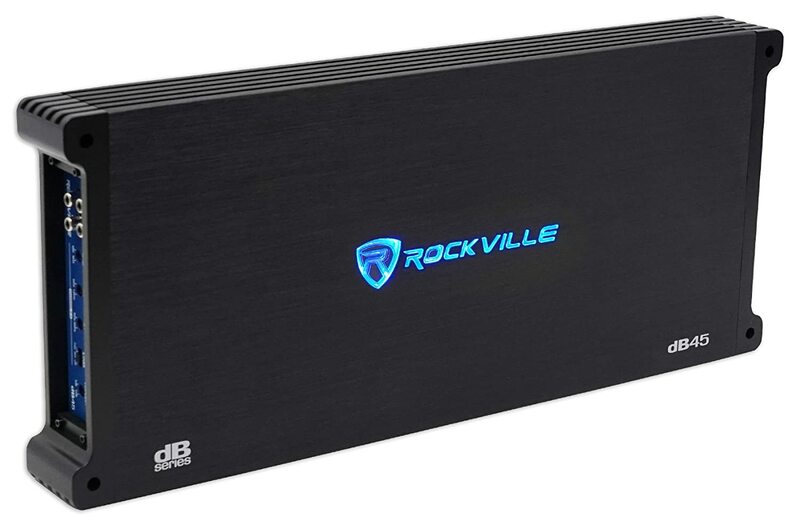 Best of all, the Rockville dB45 provides loads of power while keeping stable. This is because all three power output configurations have a total harmonic distortion rating of less than one percent. If you are looking for the best 4 channel amplifier without breaking the bank, the Rockville dB45 might be your go-to solution. We found that the low and high-pass filters were able to balance the high trebles and the deep bass wonderfully on our 10-inch speakers and rear subs. Plus, even at maximum settings, there was no indication of overheating or distortion. The dB45 is designed with entry-level car audio hobbyists in mind. That is why it is packaged with all the required materials for easy installation and bracketing, which took us roughly ten minutes. However, if this is your first time you may need as much as twenty minutes for chassis mounting unless you decide to stow it under the passenger seat. 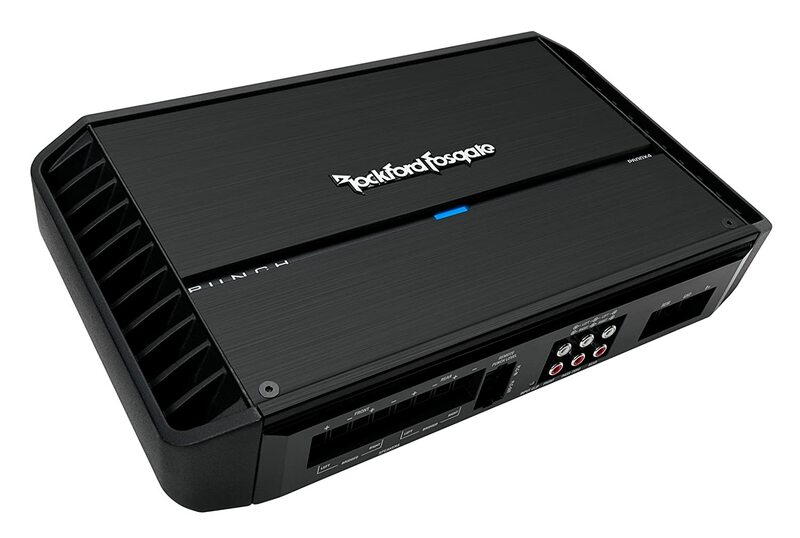 The Rockford R300X4 is a barebones car audio amplifier that, despite its simple functionality and low cost, ranks among the best 4 channel amplifier devices on the market. The R300X4 is a premium entry-level multi-channel amplifier for those who are looking to upgrade from the standard mono amp. Featuring a cast aluminum heatsink with easy-access top mount knobs and dials, the R300X4 is a worthy addition to Rockford’s R-Series lineup of hobbyist car audio solutions. Asides from power output, the R300X4 boasts a respectable RCA level input that can accommodate a wide range of frequencies. Plus, this model comes standard with 12 dB per octave Butterworth crossovers that allow the user to personalize the amount of bass they want the subwoofers to produce. It is not that this device is underpowered, but that most of its rivals are overpowered. At only 50W RMS per channel, the R300X4 is still more than capable of producing enough sound to wake the neighbors up if you blast the system at maximum settings. Plus, the sound is always well-balanced and EQ-adjusted for crisp, undistorted sound regardless of output levels. The minimalist design of the R300X4 lends itself well to installation, even for beginners. All the materials required for chassis mounting are provided in the box, and the procedure from start to finish should take no longer than 20 minutes for first-timers. The Pioneer GM-D8604 is a 4-channel car amplifier that can provide a surprisingly powerful output at a fraction of the cost of its rival models. 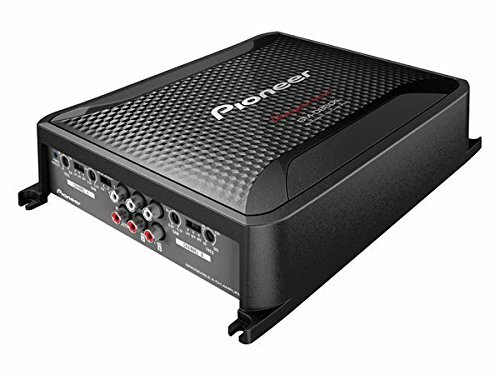 As one of the oldest and most reliable brands in the car audio industry, Pioneer has recently updated its GM Series of budget-friendly multi-channel car audio amplifiers with the D8604. A worthy addition to the lineup, the GM-D8604 is a highly portable and clear-sounding amplifier. It provides the quality expected of a car audio hobbyist while, rather unsurprisingly, falling short of the audiophile-level quality that professionals might expect. For those with a standard mono-channel amp, the GM-D8604 will provide a major upgrade that is well worth the price if you value having well-balanced audio. For instance, this model features high and low-pass filters in the range of 40-500 Hz at 12 dB per octave for superior audio performance across all four channels. While this model does not include 4-gauge power wires or ground lead wires in the box, we recommend taking a trip to your local hardware store to pick up these items. This is because your amp will be able to provide more reliable power to the subwoofers or loudspeakers with a diminished risk of overload or shortage. If you are searching for the best 4 channel amplifier while on a strict budget, you won’t be disappointed by the performance offered by the wallet-friendly GM-D8604. In our experience, 100W RMS of power to each of our 10-inch speakers was more than enough to rock our entire car with crisp, bass-heavy sound. Plus, if you are interested in providing the best bass possible, you can always stack this amp with a mono amplifier dedicated to a subwoofer. This way, you won’t have to share wattage with the speakers. Included in the box are four 5/8-inch screws and a 3mm Allen key for easy setup. Plus, there are two speaker adapters included in case some of your loudspeakers do not have the necessary hardware to attach to the amp inputs. With this unit, everything needed for installation is provided for you the process from end-to-end takes no more than a half an hour. The Rockford Fosgate P600X4 pushes the boundary of what even the best 4 channel amplifier is capable of. If you want serious power and performance for your car audio system, the P600X4 is a formidable solution that can pump out over 600W of power between all four channels. But, how does it compare to the similarly priced models by rivals Alpine or JL Audio? With a total power level of 600W, you would be hard-pressed to find a 4-channel amplifier that can push this kind of wattage at a comparable price. For example, we could not find a single 4-channel amp able to bridge channels at a 4-ohm setting while providing 300W RMS. In other words, the P600X4 is about as good as it gets in its performance category. When it comes to sound distortion, the P600X4 boasts an impressive sub-one percent Total Harmonic Distortion (THD) output at both four and two-ohm settings. Plus, the tone controls on this unit are unparalleled with up to 18 dB added EQ2 bass to Channels 3/4 and up to 12.5 dB for the remaining channels. After testing the P600X4 in our four-door Chevrolet Silverado, we firmly believe that this amplifier has set a new standard for audiophiles. With abundant power and a whopping 12.6 volts of battery output, the frequency response during our test run cleared over 100 kHz while remaining crisp, clear, and undistorted. Unfortunately, the P600X4 features a heavier build which makes it incompatible with some compact car chassis units. However, most modern vehicles will have no problem accommodating the P600X4 and users will be pleased with the speedy C.L.E.A.N setup process that Rockford Fosgate is known for. If you want to build a versatile 4-channel car audio system, the Alpine MRV-F300 is a reliable and highly customizable solution for your performance needs. 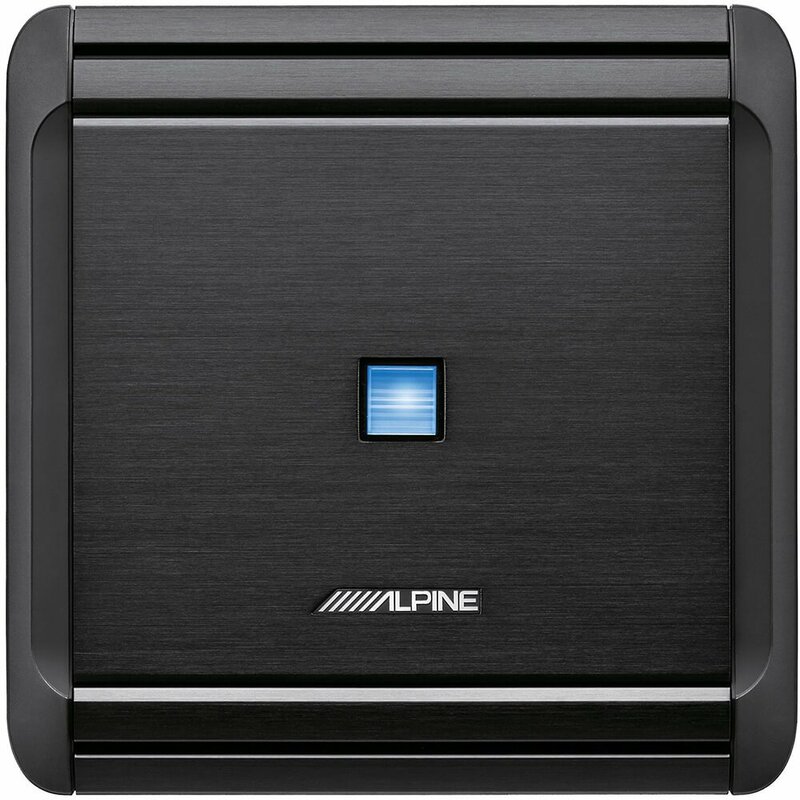 For decades, the V-Power amplifiers have been synonymous with the Alpine audio brand, largely due to their superior adjustment capabilities and high performance that toes the line between consumer and professional grades. The latest addition in Alpine’s V-Power Series of high-performance car amplifiers, the MRV-F300 packs a respectable amount of power at an affordable cost. With peak power output levels, the MRV-F300 ranks among the best 4 channel amplifier choices if you want reliable performance across all four speakers. The MOSFET power supply is fully compliant with CEA-2006 standards to provide a safe, reliable and, most of all, efficient source of power. Best of all, three-pronged protection safeguards this model against thermal shutdowns, shorts, or overloads. This 4-channel amplifier features high and low-pass filters in the 50-400 Hz range at 12 dB per octave, which is more than enough range to pick up any sound detectable to human ears. For those who like a little extra bass in their music, there is an adjustable bass boost setting for up to 12 dB of low-frequency bass on the rear channels. When hooked up to our two pairs of 10-inch JL speakers, we were able to blast the sound system at near-maximum settings without any blowouts or overheating inside the chassis. The highs were crisp and distinct, and the low-frequency bass was heavy and more than enough to jiggle the frame of the vehicle around. Although not the ideal choice for those who want a dedicated bass amplifier, this model is one of the finest 4-channel amps in its performance category. With an added EQ feature built into the amplifier, the sound quality is always well-mixed and perfectly balanced so that even the pickiest audiophiles will be pleased with the output. At a lightweight 4.5 pounds, the Alpine MRV-F300 can be easily screwed into any car chassis. However, if you already have an amp installed and you need a secondary location for the MRV-F300, it is small and inconspicuous enough to slide under the driver’s seat and even be Velcro-attached to the bottom so that it is firmly fixed in place. I hope this guide has been helpful to help you select the right 4 channel amplifier that will power your car’s speakers. Do check out our latest guide to the best amplifier for cars. and if you need more power , our guide to the best 5 channel amp is very helpful.